CEDAR CITY — Current University of Nevada Las Vegas interim head coach, Todd Simon, was hired as the new men’s basketball head coach at Southern Utah University. Athletic Director Jason Butikofer made the official announcement to the men’s basketball team Tuesday night. 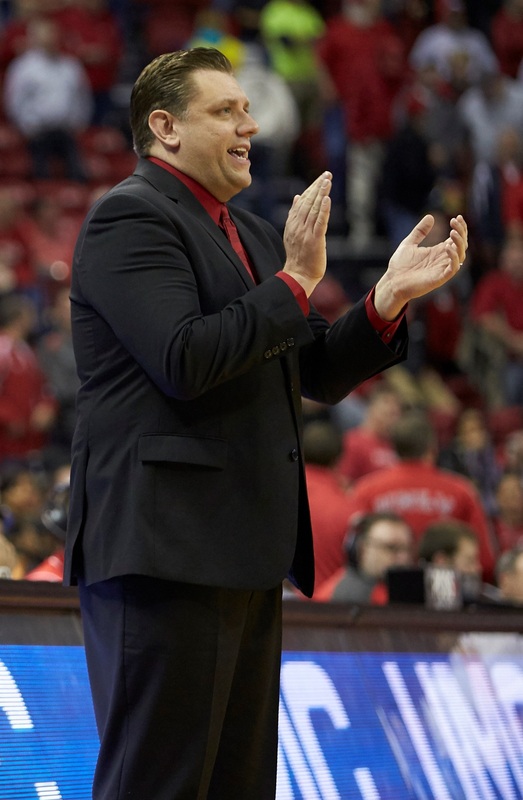 Simon was named interim head coach of the UNLV men’s basketball program in January 2016 and immediately led them to three consecutive victories. During Simon’s 17 games, the Runnin’ Rebels ranked as the number one team in the nation in adjusted tempo, scoring more than 100 points in four games. UNLV finished with a 9-8 record, despite playing with as few as five scholarship players. Prior to being named interim head coach, Simon was in his third year as associate head coach with UNLV and had a critical role in assembling UNLV’s roster, which Rivals.com ranked its 2014 recruiting class #5 in the nation, while the 2015 class was ranked #11. “My family and I are thankful for the opportunity to become the newest members of the SUU family. We are eager to get ingrained into the SUU and Cedar City community. I could not be more excited for the opportunity ahead and look forward to bringing an exciting brand of basketball to the Centrum,” said Simon. Prior to his tenure as a Runnin’ Rebel, Simon served Findlay Prep for seven years in both head and assistant coaching roles. As head coach at Findlay Prep in 2012-2013, he led the team to a 35-1 record, including eight wins over top-25 ranked teams. The 35 victories are the most wins in school history. During Simon’s tenure at Findlay Prep, they accumulated an overall record of 192-9. During his career Simon has helped develop and coach several players that have become top NBA draft picks, including Anthony Bennett, who was selected as the top overall pick in 2013, Rashad Vaughn, who was picked No. 17 in 2015, and Avery Bradley. Other NBA player’s Simon has coached in his career include Christian Wood, Jorge Gutierrez, Cory Joseph, DeAndre Liggins, Nick Johnson and Tristan Thompson. A native of Fowler, Mich., Simon earned his bachelor’s degree from Central Michigan with a double major in sport studies and management information systems in 2003. He earned his master’s degree from UNLV in sport education leadership in 2010. Todd and his wife, Kati, have three boys: Rece (4) and Raylan (3) and Ryder (3.5 months). A press conference was held today at the SUU Hunter Conference Center within the Charles Hunter Room to introduce Simon.